A couple of weeks ago Allan Morton in Australia sent us a family tree of the Morton family, and this morning I was going through it, comparing his information with ours and entering people he had that we did not, and I entered the 20000th person into our family history program. That was an interesting milestone, because we have been adding to the same database for nearly 30 years. When we started our family history just after we were married in 1974 we did not have a computer, so kept all our records in paper files. It was only eight years later, in 1982, that we got our first personal computer, a NewBrain, but there was no genealogy software that ran on it. In 1985 we got an Osborne Executive, which ran CP/M, and there was a genealogy program for that, called Roots/M, but as the computer had only two single-sided floppy disks, there was not much room for data, and we had different disks for each branch of the family. The Osborne was one of the early portable computers, though “luggable” was a better description, it was bulky, heavy, and had no batteries. You had to plug it into the mains. Nevertheless we took it on holiday with us in our caravan, and spent several hours with a cousin, Don Stayt, who also had an Osborne, sharing family history information. Our next computer was a Copam, which we got in 1987. It ran MS DOS 3.1, and had a hard disk. There was an outfit in Cape Town called the Joint Software Exchange which distributed shareware and freeware programs, and one of the disks in their catalogue had a selection of genealogy programs. I tried them all, and the one that seemed most usable was the Family History System (FHS) written by Phillip Brown. Like some present-day programs it came in two versions: a free one, which you could use with no limits, and a paid version, which had extra features. The original version also came with the GW-BASIC source code. So in 1987 we began entering our genealogy into FHS, and we have been doing so ever since, using the same program for nearly 30 years. Perhaps that is some kind of record. Well, it’s not quite the same. In 1989 we got a newer version, and, having decided we liked it, upgraded to the extra features in the paid-for version. And in 1993 we upgraded to a version that was newer still. FHS had its limitations. It did not have fields for recording religious ceremonies like baptisms and burials, and the only way of recording sources was in the notes field. But there were other programs that had those features and it was easy to export the data to the other programs using Gedcom. And it is in Gedcom transfer that FHS excels, and has features that no other program has, which is one reason we continue to use it. If a 6th cousin twice removed is interested in family history, and asks fir a Gedcom file, FHS makes it easy to create it. It allows you select the blood relations of any person in the file — that person’s ancestors, descendants, descendants of all ancestors, but not ancestors of all descendants, since those are not necessarily related to the person you choose. You can, however, for completeness, include spouses, children of spouses, parents of spouses and spouses of children. FHS makes it easy. Every other program I have tried makes it very, very difficult. The other thing that FHS makes easy is exporting a range of RINs (record identity numbers). So if I look at Legacy (one of the other programs I use) and see that the highest RIN is 19676, I just tell FHS to export from RIN 19677 upwards to a Gedcom file, and import those into Legacy. It is much more difficult to do the other way round — export a range of RINs from Legacy; in fact it’s so difficult that I’ve never tried it. So we continue to enter our data into the same program that we have been using for 29 years, and have now reached 20000. And as long as the program continues to run, we will continue to enter the data into it. Well, until it reaches 32000 records or thereabouts, because that is the limit of the number of records it can hold. But we haven’t reached that yet. Here are some statistics for our Family History Wiki in 2012. It is a bit of a mystery why 1815 people (that’s nearly five people a day) should be drawn to a page for discussing Alfred William Green, but then completely fail to discuss him when they get there. By contrast, only 130 people visited the page that actually has information about Alfred William Green. Jessie Schultz was Val’s great great grand mother, who came to South Africa from Germany in 1858, and it would be nice to know if any of the people who visited her page are related to us, but none of them is saying. That’s quite a lot of visitors, but the emptiness of the “Messages” section shows that the feedback is almost zero, which is why the edits are relatively few. If few people respond, there is little motivation to add to the information. So I’m still a bit disappointed. I thought the wiki format was ideal for family participation, and that other members of the family could help to contribute to information, especially with family stories and biographical information. I hoped that some cousins might start their own wikis, where the relations we have in common could be linked across two wikis, and then their own wiki could branch out to the unlinked families on their side of the family. In that way we could have a whole network of interlinked family wikis. But somehow it has never reached critical mass, and never taken off. But maybe this year will be different. Would it be too much to hope for — that we could have one linked family wiki a month? Or even a quarter? Or perhaps even one for the whole year? It’s quite easy to start one on Wikispaces, but it doesn’t even have to be there, there are other wiki sites as well. Yesterday we received the birth certificate of Val’s great great grandmother, Mary Nevard Morton (1843-1918), which revealed that her mother’s maiden name was Elizabeth Nevard.We had long had Mary Nevard Morton’s marriage certificate, which showed that she married August Decker at St Botolph’s Church in Colchester, Essex in 1856. The marriage certificate did not give her age, but merely described her as a “minor”, so we applied for her birth certificate in the period 1837-1840, and it was not found, so we assumed she had been married before the beginning of secular registration in 1837 — after all, she would still have been a minor if she had married in 1836. It was only finding her in the 1851 census that revealed just how minor she was — she married at 13 — and so enabled us to ask for the birth certificate in 1843. So now, of course, we are looking for Elizabeth Nevard’s parents. According to the census she was born in Boxted, Essex, in about 1806, so we’ll be looking for a baptism record for her around then. Solve one family history mystery, and another dozen spring up to take its place. Last week we had a breakthrough with Val’s Morton ancestors, described in the previous post. Val’s great-great grandmother, Mary Nevard Morton, married August Decker of the British German Legion at St Botolph’s, Colchester in Essex on 31 October 1856. We’ve known that for more than 30 years. But now it appears that two of Mary’s sisters may also have married German legionnaires, possibly on the same day, and we have ordered their marriage certificates just to make sure. and Emma Morton alias Rodwell married George David Julius Casdorff. They sailed to the Easten Cape on the Stamboul, and disembarked at Eastlondon on 2 February 1857. According to the German Settlers Database George Kasdorf purchased his discharge on 16 February 1860. Having finally found the Morton family in the 1851 census we know Mary had a sister Emma, and when August and Mary Decker had their first and only son Edwin baptised at King William’s Town in 1861, the godparents were George and Emma Castorff. But that seems to be the last sign of George and Emma in South Africa. Searching for Castorff or Casdorff (and Kasdorff and Kastorff) in the South African archives index NAAIRS draws a blank, and they should have appeared there if they died in South Africa. There are a few references to Kasdorf, but none appear to be related. So they must have emigrated again, as many of the German military settlers did. Any reports of sightings anywhere will be gratefully received. We’re taking another look at the mystery of the Morton family of Colchester in Essex, and their South African connections. Over the last week or so, as you can see from the previous posts, we’ve been looking at the family of Val’s paternal grandmother, Emma le Sueur, formerly Green, formerly Chelin, born Decker. When we started looking into the family history, soon after we were married in 1974, she was our only survivang grandparent, and so we started with that side of the family, and within a couple of years had got down most of the (then) current generation in Southern Africa. A few years later a German genealogist helped us to trace one branch of them back to the Brandenberg Huguenots. But one branch we were stuck on was the Mortons. Val’s gran and her surviving brother Cecil Decker, and her sisters, told varying stories. She told us her father was Edward Decker. Turned out he was actually Edwin Robert Morton Decker, and we found his baptism in King William’s Town. Grandmother and great aunts told us that Edwin’s father was De Nevard Decker, a Swedish nobleman, or a French nobleman, and that his wife Mary Morton came from Colchester in Essex and had an aunt or a sister who was Lady Mount, a lady-in-waiting to Queen Victoria. We found August Decker’s death notice in the Cape Archives. Not a Swedish nobleman, but a German waiter, died at Mr S. Grussendorf’s house, no property, buried by public subscription. The real disappointment was the family connections — parents unknown, spouse unknown, one son, name unknown. Well, we found the link to the son in the King William’s Town Anglican baptism register, but also in the KWT museum we asked if they had anything not on display, and they had a card index of the German military settlers of 1857, and August Decker was there, and it said he came from Auerstedt in Prussia. We knew that a lot of the German military settlers of the British German Legion had come from Colchester Camp, where they had trained to fight in the Crimean War, and that gave us a date – 1856. So we wrote off to the General Register Office in England for the marriage certificate, and got it. August Decker and Mary Nevard Morton were married at St Botolph’s Church in Colchester on 31 Oct 1856. His father was Carl Decker, farmer. Her father was George Morton, gardener. That helped with the Decker family, but what about the Mortons? Some time soon after that we trawled through microfilms of the 1851 census of Colchester at the LDS Family History Centre, but found nothing. Perhaps we missed it, perhaps we were looking in the wrong place. At that point we more or less gave up 0n the Mortons. 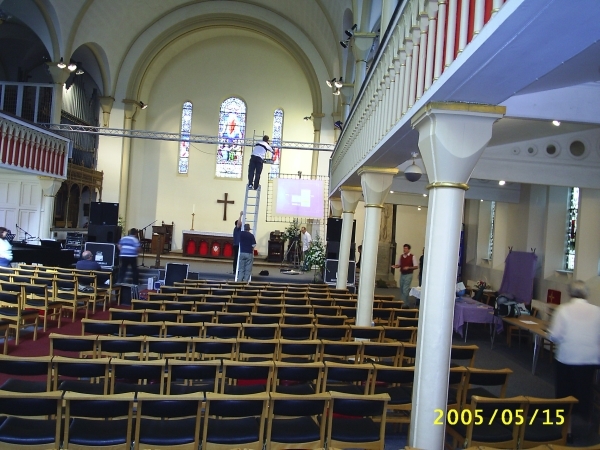 We visited Colchester when we went on holiday to the UK in 2005, and even looked in at St Botolph’s Church, where they were preparing for a play or a concert of something. We had heard many things about Essex girls, and wondered if their reputation had been the same in 1856, when Val’s great great grandmother got married. A sign in a shop window in Colchester seemed to confirm what we had been told about Essex girls. After the death of her first husband, Mary Nevard Morton married another German military settler, Ernst Bergesheim or Burgersheim, from Stralsund in Prussia. At one point they ran the Butterworth Hotel in the Transkei, and she also ran the Waverley Hotel, between Tarkastad and Queenstown, and Val’s gran was brought up there after her father died when she was 8. Mary Burgersheim died in Durban during the flu epidemic of 1918. Now, looking at that side of the family again, we did manage to get hold of the 1851 census which shows Mary Morton, aged 8, with her parents, George and Elizabeth Morton, both aged 45, and therefore born about 1806. Elizabeth came from Boxted, up near the Suffolk border (perhaps nearly not an Essex girl!). Mary had an older brother G. Fred, and an older sister Emma, aged 10. Her younger siblings were Thomas (3) and Catherine (1). And here’s where the mystery deepens. If she was 8 in 1851, she was surely too young to get married in 1856, when she would have been only 13, even as a minor with her father’s permission. It must be the right family, unless there was another George Morton in Colchester who was a gardener and had a daughter Mary. And the FreeBMD site shows Mary Nevard Morton being born in 1843. FreeBMD also shows an Emma Morton being born in 1838 (when we would have expected Mary to be born) and dying in 1839. Then there is Mary Nevard Morton in the June Quarter of 1843. Emma is dead, long live Emma. She shows up alive and well and aged 10 in the 1851 census. And get this: on the same index page as Mary Nevard Morton’s marriage to August Decker, TWO Emmas married a George David Julius Casdorff — Emma Morton and Emma Rodwell. As if that were not enough, on the previous page of the FreeBMD index, an Elizabeth Mount Decker married another German. Perhaps she was the “Lady Mount”! It looks as though we will need to order the other two marriage certificates, as well as Mary Nevard Morton’s birth certificate to see what happened. One of the interesting stories about the German military settlers is that some of them were married on board ship (presumably to Essex girls) just before the ship sailed. At the end of the ceremony one of the ship’s officers remarked to the chaplain who married them that he thought some of them were holding the wrong hands. “Don’t worry,” said the chaplain, they can sort themselves out when they get outside.” The result was that a special Act had to be passed by the Cape Pasrliament, to remove doubts concerning the marriages of certain German settlers. Now I’m wondering if there wasn’t a similar chaotic scene in St Bololph’s Church, with hundreds of German soldiers marrying Essex girls, and perhaps two Emmas marrying poor old George Casdorff. And somewhere, in the back of my mind, is a memory of one of the documents in the family history being signed by a George Castorff, as a witness or something. And one last thought. Val’s middle name was Muriel, and it was said that she was given it after her paternal grandmother, Emma Muriel Decker. And perhaps the Emma came from her aunt. But there are more mysteries. When she signed for her share of the Koch inheritance (see earlier post), a fifth of a sixth of a third, she signed Emma Isabel. So we thought we would order her birth certificate to see what names she was registered with. The certificate came back with a rubber stamp in the space for the first names: Not Stated. Attempts to see if she was in the baptism register for Butterworth in 1900 were not successful. Perhaps we should try again. But at any rate we now have a lot of things to try for on that side of the family.